The Cook Islands Fruit-Dove (Kūkupa) lives only on the islands of Rarotonga and ‘Ātiu, making it a 2-island endemic of the Cook Islands. It was recorded on Ma‘uke in the 1820s but was lost sometime before 1970 - cause unknown. It was also in the fossil record of Mangaia but was lost before the arrival of the Missionaries. It is the Cook Islands most colourful native bird. Its typical call on Rarotonga is a mournful "OOOOO-OOOO-OOO-OOO-ooo-oo" with each coo being softer and shorter than the one before, while on ‘Ātiu it is typically "OOOOO-OOOOO-ooooooo" with the final note distinctly lower. It is common in the mountain forest of Rarotonga, and in makatea forest of ‘Ātiu. They often venture onto the horticultural areas of both islands, but usually fail to nest successfully because of predation by cats (introduced in the 1820s), and harassment by the Common Myna (introduced to Rarotonga in 1906, and to ‘Ātiu in 1915). Although few nests have been reported the main nesting season is probably August to October, with one reported in July. In August 1997 Jeanne and Rosaline Tianoa and Georgina Maui reported that they had a Kūkupa nesting in a Lychee tree in their yard in Avarua. The nest was only two metres off the ground and relatively easy to observe. After being told that the details of Kūkupa nesting had never been recorded the women decided to record the behaviour of the birds. Thus began six weeks of detailed observations. The nest was found on 1st August containing one white egg. The lay-date was unknown but after 12 days the egg hatched on 12 August around dawn. The birds were distinguished by colour and behaviour. Light Pink incubated at night, was smaller, was more greyish in colour, had a white tail-bar, and its beak was shorter, grey and light pink, and it looked away from the observer - the researchers thought this was the female bird, and the bird in the photo has similar features. In contrast, Dark Pink incubated during the day, was larger, was more colourful, had a yellow tail-bar, and its beak was longer, yellow and dark pink, and it stared at the observer. Light Pink's night-shift usually started around 5pm and continued until around 9am next morning, and during daylight incubation the nest was periodically left unattended for 5-7 minutes at a time. Mynas regularly approached the nest tree and sometimes harassed the fruit-doves. For example, on chick-day 4 around 4pm a myna landed on the branch near the nest and actually attacked the dove that was standing near the nest. The dove chased the myna away from the nest tree and then returned to sit on the nest. The chick opened its eyes on chick-day 5 and had a few feathers. By chick-day 9 it was almost covered with small feathers. During these first days an adult was almost always covering the chick, and periodically the chick was fed on a green fluid by pecking inside the adult's open mouth. After chick-day 9 the chick was able to stand and the adults left it unattended for up to an hour at a time. By chick-day 14 the nestling had small green wing-feathers with yellow and white edges, green tail-feathers with yellow tips, and white down under the tail - the young bird in the photo has similar features and might be about 14 days old. The chick also started to periodically climb onto the branch beside the nest, and the adults started feeding it on berries. On chick-day 16 the chick was hopping from branch to branch after the adult and around 3pm it flew a few times about 30cm from one branch to another towards the adult. At 4.30pm it fell out of the tree and was put back by Mr Tianoa. Chick-day 17 the adult hopped and flew from branch to branch and although the chick hopped along some branches it did not fly. Chick-day 19 was a day of drama. It dawned to find that Light Pink had been killed in the nest-tree during the night by the cat, which was banished in disgrace to a relative's place. The chick was attacked by a myna at 8am, and at 9am it flew to a nearby tree. The lone parent attended it most of the time and fed it purple fruit from inside its mouth, and it also put berries on the branch next to the chick. During the next 10 days the young flew from tree to tree calling and was fed by the lone adult, which also chased away harassing mynas several times. From chick-day 22 another Light Pink dove started approaching the nest tree, Dark Pink and the chick. Dark Pink usually chased it away, and a couple of times it attacked the chick. Several times mynas attacked the chick and they were chased away by Dark Pink. On chick-day 30 the adult was still feeding the young; Dark Pink fought off some mynas; and when last seen Dark Pink and its young were flying southwards towards the mountains. The idea that Light Pink was the female bird could not be verified, but it is consistent with information from other fruit-doves indicating that females are typically smaller and paler in colour than males. Here we also have the interesting further information that the smaller, paler bird incubated throughout the night. The birds were seen to eat the fruits of Cordyline (Rautī) and flowers of the Carambola (Raparapa). This was a very important piece of research. If anybody else has a similar opportunity to observe the details of the nesting behaviour of a Cook Islands bird it would be a pleasure to make it available on this website. Please see the Contact page for more information. 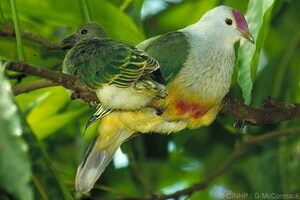 McCormack, Gerald (2005) Cook Islands Fruit-Dove (Kūkupa). Cook Islands Natural Heritage Trust, Rarotonga. Online at http://cookislands.bishopmuseum.org.